Based on research The American Institute for Cancer Research helps fund, evidence is clear that weight can affect your risk of developing cancer. Many cancers in the U.S. could be prevented by maintaining a healthy weight, being physically active and eating a nutritious diet. We will send you email updates on ways to help reduce your cancer risk, learn about AICR’s latest cancer research, and more. You can unsubscribe at any time. Children and Teens BMI: This adult BMI calculator should not be used to determine the weight category for your child or teen. Ask your pediatrician or use the CDC’s BMI calculator. Here are two methods for assessing body fat. While they’re not perfectly accurate, they both tell you whether, and how urgently, you need to take steps to control your weight and reduce your cancer risk. Body Mass Index is one common method used to measure overweight and obesity. BMI is a measure of body fat based on a person’s weight and height. The BMI chart shows four ranges: underweight, healthy, overweight and obese. Staying within the healthy range throughout life is important for lowering your cancer risk. Waist circumference is another method of assessing your body fat. All you need to do is find a tape measure and follow these easy steps. 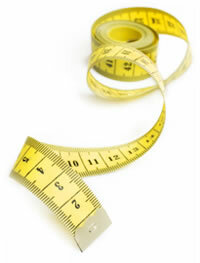 Place a tape measure around your waist above the tip of your hipbone. Measure your waist after exhaling. Determine your health risk. For women, a waist measurement of 31.5 inches or more indicates high risk. For men, a waist measurement of 37 inches or more indicates high risk. *BMI may not be an accurate measure for everyone - including people who have more muscle mass (like athletes), seniors with less muscle mass or people under 5 feet tall. If you are at high risk, learn how you can lose weight. If you are not at risk, learn how to prevent weight gain. For example, a person who weighs 150 pounds and is 5 feet 3 inches tall has a BMI of 26.5. To use the table, find your height in the left-hand column labeled "height." Locate your weight (in pounds) to the right. The number at the bottom of that weight column is the BMI for your height and weight.